The Undeads vs. KISS: Who copied whom? 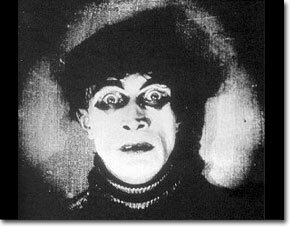 Clearly, the Undeads are intended to call to mind Cesare the Somnambulist, from The Cabinet of Dr. Caligari, which dates from 1919, and is generally credited as being the first horror film. Their makeup, costumes, zombielike movements, and the design of their stage set are all in obvious homage to Cesare and Caligari. Conrad Veidt as Cesare, the original Undead. 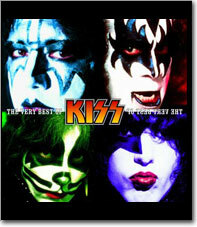 Nevertheless, we are constantly asked whether the Undeads modeled themselves after KISS, or vice versa. KISS's first live show in makeup was on January 30, 1973. Over the next few months, KISS had a number of live gigs in New York. By December of 1973, KISS had secured a recording contract, and was busily recording their first album at Bell Sound Studios, in New York. December of 1973 -- around nine months after KISS had started performing in makeup -- was exactly when the Undeads were being filmed in Dallas for Phantom. KISS's first album was released (with KISS, in makeup, on the cover) in February of 1974, some eight months before anyone had seen Phantom. By the time Phantom premiered, on October 31, 1974, KISS had already performed on national television, in makeup, on the Mike Douglas Show and ABC's in Concert, and had released their second album. January 30, 1973: KISS performs in makeup. December, 1973: Undeads film in Dallas/KISS in recording studio. February, 1974: KISS releases first album. October 31, 1974: Phantom premieres. 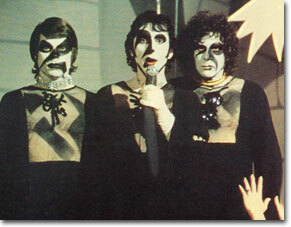 Given this chronology, it's simply inconceivable that KISS got their makeup ideas from The Undeads. Sorry. It also seems fairly unlikely that Phantom's makeup design was inspired by KISS, given KISS's relative lack of notoriety in the winter of 1973, when Phantom was in production; by the time KISS got their first nationwide exposure, Phantom was in postproduction. What seems far more likely is that the principal inspiration for the Undeads' makeup and morbid behavior, apart from Cesare, was Vincent Furnier, the frontman of the Alice Cooper band, a pioneer in bringing grisly horror motifs to rock music, who, by 1973, had been wearing ghoulish makeup and performing gory stunts onstage for years. His footsteps have been followed more recently by Marilyn Manson and zillions of goth bands. Furnier's use of stage makeup is very possibly the link that inspired transferring the Caligari look to the rock'n'roll milieu. While many male rockers of the period were putting makeup on with a trowel (David Bowie, Marc Bolan, Gary Glitter, Mick Jagger, etc. 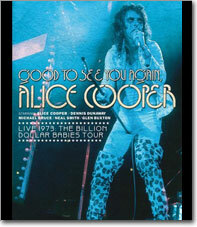 ), the Alice Cooper act, unlike the others, but in common with The Undeads, featured general ghoulishness, and made the death/entertainment connection: they performed with guillotines and liberal amounts of stage blood, wore corpselike makeup, and titled their songs "I Love the Dead", "Sick Things," "Dead Babies," and "Killer". KISS's makeup and overall aesthetic, on the other hand, was more lively and had nothing to do with evoking deathlike or gothic imagery. So, in the KISS vs. The Undeads contest, the winner is: Alice Cooper. 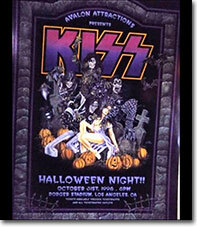 The story goes that, in 1998, KISS's Gene Simmons stiffed an artist on a couple of posters. To make rent, the artist painted and issued this unofficial poster for the KISS concert at Dodger Stadium on Halloween that year, signing the poster "William H. Pratt," which is Boris Karloff's real name. 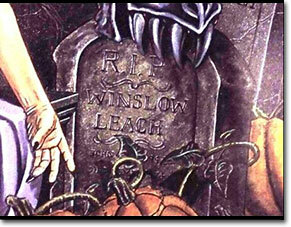 The connection here is that one of the names on the tombstones is "Winslow Leach," presumably a nice allusion to artists getting ripped off by powerful industry operators. Our understanding is that the artist was eventually paid by Mr. Simmons. Inquiries may be directed by email to archivist at swanarchives.org. The words "grand guignol" appear nowhere on this site. All website text, design, and coding is Copyright 2006-2019, Ari the Principal Archivist. No claim is made to the copyrighted works, trademarks or service marks of Harbor Productions, 20th Century Fox or A&M Records, and The Swan Archives is in no way affiliated with any of these entities.